Ooooooo weeeee! I blew through the Thanksgiving basket! Now it is time for the Christmas smells. But first! Wax I would repurchase from the last basket includes: RG Pecan Waffle Butterbrickle, RG Pecan Waffle Smoothie, RG Sweet Lavender Marshmallow, SMT Pumpkin Pecan Waffle. Sniff My Tarts- IceCream Scoop Bread/Honey Gingerbread so stinkin' good! If you would like to know more about any of these scents specifically, just holler! My candle of the moment is Bath & Body Works Cranberry Woods from a couple of years ago. It is nice to know these have a decent shelf life. It smells fantastic. Black currants, tart cranberries and a touch of musk and wood. Strong throw, great burn. December 1st kicks off our Christmas Advent Calender. 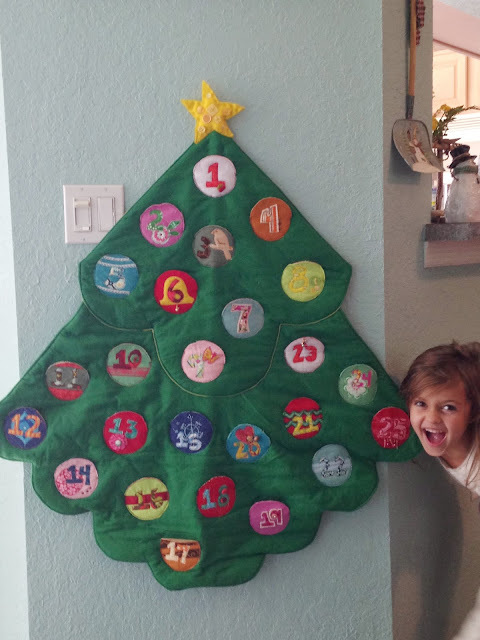 I had coveted Pottery Barn's felt advent tree for many years but just could never pull the trigger. I finally decided it was time to craft my own. Each ornament is a pocket that holds a slip of cardstock that has an activity or small gift inside (candy cane, finger puppet or such). Some of the activities include: the candy cane story, acting out the Nativity story with props, glow stick bubble bath, Lights of Lakeland, getting our Christmas tree, baking cookies, visiting relatives, Christmas movie and popcorn, toasting marshmallows, and so on. The girls take turns checking the pocket each morning. Someone was happy to see it again. She helped me decorate the house while the oldest was off hunting dove with her Daddy. The smelly sisters liked the ice cream, maybe some Christmas ice cream with the girls would be fun. We have a bread machine that we use once a year to make dough for sticky buns. yum! Icecream in Florida is always I good idea! Thanks Jean! I will let the girls pick fun toppings too. My mom had a bread machine when I was young. Mmmm! I don't but I could have them help me bake something fun. Sounds good. Baked doughnuts? I haven't done those. Neither have I. I know what recipes I will be looking up this weekend! i loooove your advent calendar!! we are just winging it this year...still stuck in the hotel... I think we're going to go see this huge light display called Illuminations. but otherwise i think we'll just be entertained by the crazy antics of Alfredo the Elf on the Shelf & Uncle Si the Christmas Elf (whose main purpose in life is to nap! lol). My prayer for y'all is that you are able to get in your house by Christmas. I love seeing your Elf on the Shelf funnies. It is one thing we can't do around here. They freak Savanna out. I wanted to call is Sandy Claws too!!! Lol! All I can hear is Oogie Boogie "Sandy Claws! Oooo! I'm scared!" I smells like a bear claw, a cinnamon bakery yummy. I will do a melted review since CFTKR smells so different melted. Your calendar is SO cool and creative! I like that you mix it up with gifts AND activities, it makest even more fun and festive. Cranberry Woods is amazing! Beautiful photo. Thank you sweet LoLo! I would love if they were ALL activities but sometimes I am beat after work and need an easy lil gifty. My cranberry woods is all used up now! It really is a great candle huh? Up next, Hot AppleToddy!